Santo Domingo Orchard began in 2008. 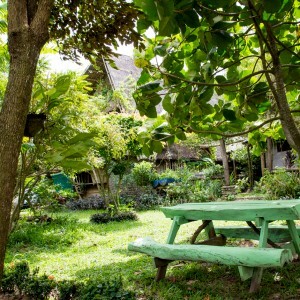 Most of the land, which had been abandoned because it was so unproductive, was converted into an orchard planted with different kinds of lumber and fruit-bearing trees common in the Philippines. Other areas were used for vegetables, herbs and ornamental plants, vermiculture, aquaculture, poultry and livestock. Our initial task was to revitalize the soil: we sprayed it with fermented fruit juices and vermi-tea and introduced earthworms. We started to culture BIM (Beneficial Indigenous Microorganisms), a similar practice to EM™ (Effective Microorganisms), to spray on to the crops, soil and wider farm. This practice still forms part of our daily routine. We referred to agroforestry.net for our orchard plans, and our aquaponics system was inspired by watching Murray Hallam’s video. The orchard was established as a research and training station by the HOMRES group, to grow food sources and test related technology that would yield the wealthiest and healthiest produce possible. Working sympathetically with the land means letting our plans evolve in their natural direction. By 2012, the orchard had progressed into an agro-forestry project, and we continued to produce organically grown food with high nutrient values, while also protecting the environment. As we built a community for our family and associates, we started to observe the principles of permaculture. 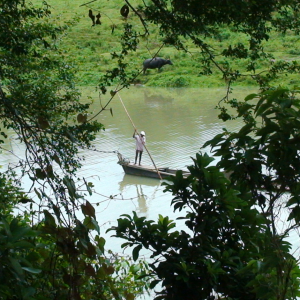 We maintained our natural farming techniques to tend to our plants, animals and aquatic resources. In April 2013 we decided to dedicate part of the orchard to growing trees native to the Philippines. This new direction for the orchard was guided by the beautiful Philippine Native Trees 101 – Up Close and Personal book, and our ultimate aim is to plant all 101 of the trees detailed in it. 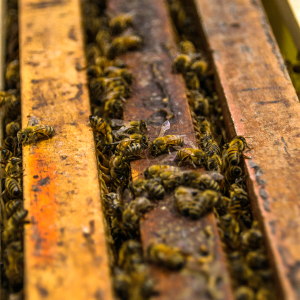 In keeping with our commitment to permaculture, we also decided to start beekeeping. 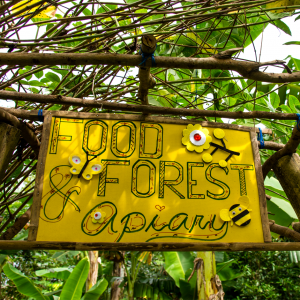 Our first apiary is now in place in our Food Forest, where our bees will pollinate our flowers and provide us with honey. Take a look at how the farm has grown since we started five years ago. We document our activities, events, and resources in Santo Domingo to guide future generations and help preserve and improve this haven by the river. Our database system containing this information will help manage the farm and we hope that Santo Domingo Orchard will grow to become training center for vocational skills needed in the community. We have some exciting new projects that are allowing us to combine resources and knowledge with other like-minded people in the area. We’re proud to be working with partners including Rapha Valley Organic Farm and Melos Food Forest. 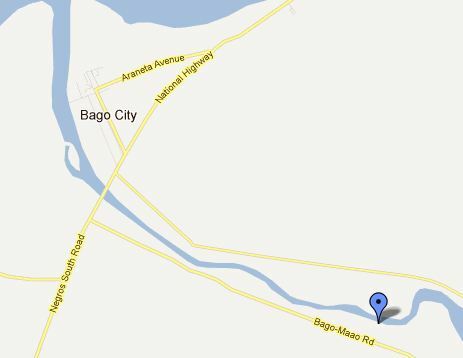 The project is by Bago River, about 4km after the Bago River Bridge along the highway going to Barangay Ma-ao. The soil is mostly sand and clay with a small loamy portion near the river. We draw water from four wells; three inside the property and another just at the boundary. The water tends to be salty during high tide. The wind comes in strong from the north from November to April, and shifts to the opposite side for the rest of the year.